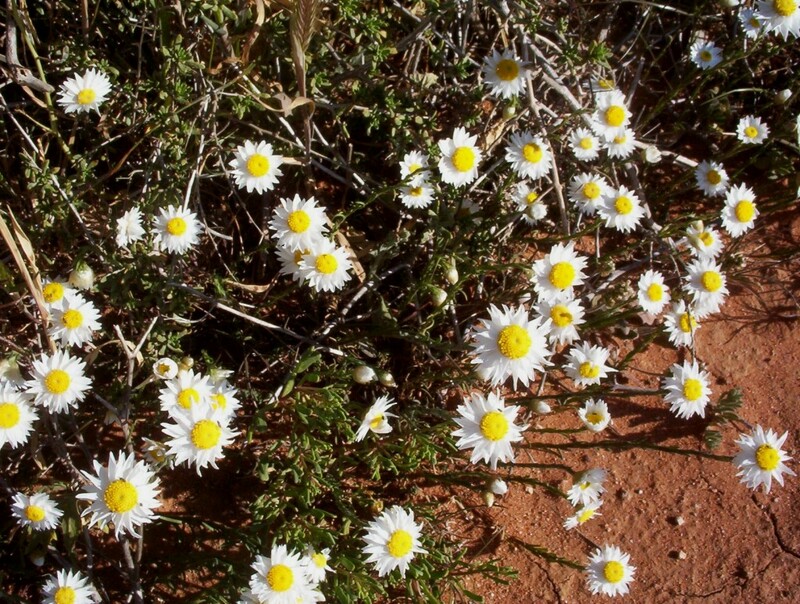 This daisy is one of the everlasting daisies and was growing like a carpet along the roadside from Ouyen through to Manangatang. I know it has had a name change from Helipterum but I am not sure whether it is Rhodanthe or not. I did not bring the daisy books with me. It is an annual and flowers prolifically. This plant grows on all soil types and in quite low rainfall areas 250mm to 350mm. In good seasons plants can be up to half a metre across. A friend often throws everlasting daisy seed around on a sand or small gravel mulch in late autumn, sprinkles the area well with water and then sits back to watch the â€˜lawnâ€™ grow and eventually sees the masses of flowers in the area. This is well worth doing. The sand or gravel acts as a mulch and retains moisture around the seed where it is washed into the nooks and crannies amongst the small stones. The flowers wire well for floral art work if picked early enough to prevent the petals from flexing back too far when they open. Trial and error is needed here, to pick the flowers at the correct stage of bud size. 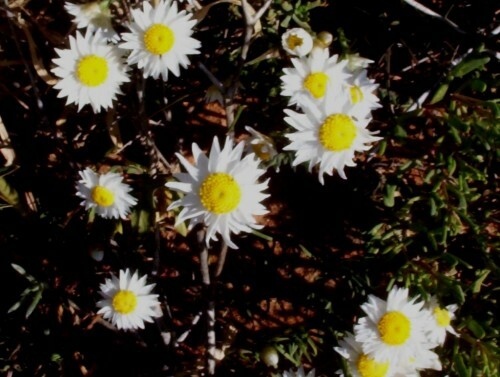 We saw masses of this lovely daisy bush as we were driving through the area from Murrayville to Ouyen, on our way to Sydney. I demanded that we stop so that I could check what Olearia it was and get some photos. 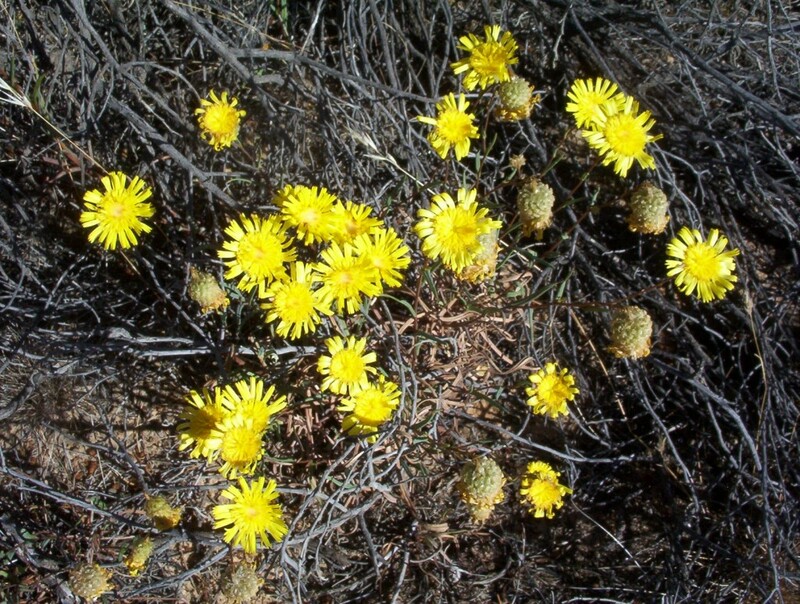 This is one of the dryland daisies, growing in amongst the mallee trees. 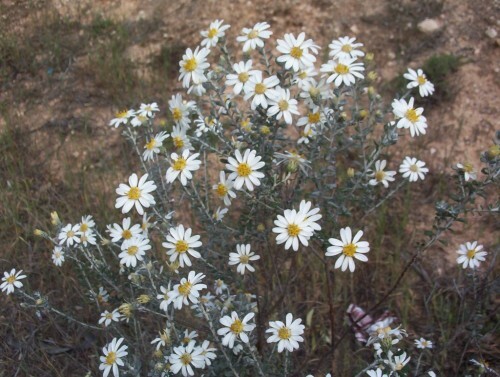 This daisy grows to about 1 metre high and wide. It begins flowering at the end of winter into spring and makes a wonderful show. It grows in most soils particularly limey soils which occur around our place. Although the books say it is used commonly as a garden plant I have not found this to be so. To have 2 or 3 of them in a group would make the most wonderful spring display in a garden. I have just been potting on some struck cuttings of three different versions of Chrysocephalum apiculatum. 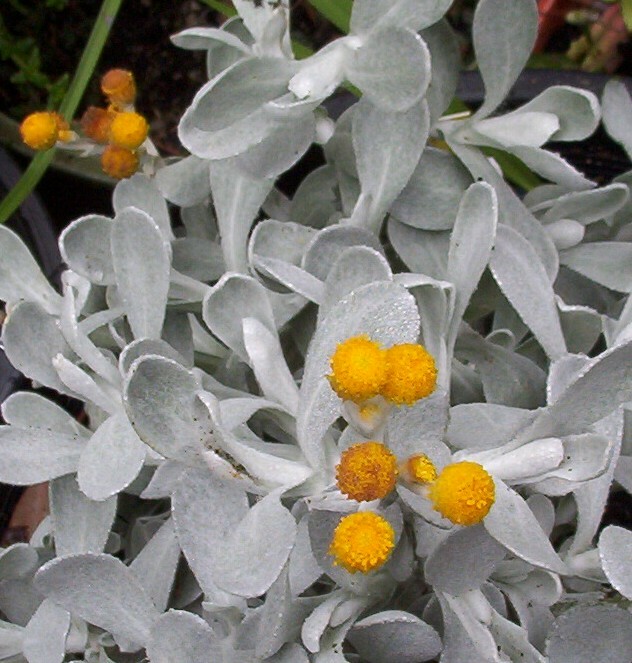 All have golden yellow ‘billy button’ flowers, are perennial, some are suckering, and there are a number of leaf forms. These plants need tidying up when new growth begins at the base of the plants. My favourites have grey/green leaves and one has distinctly grey leaves. Of course the flowers look great against these leaves. 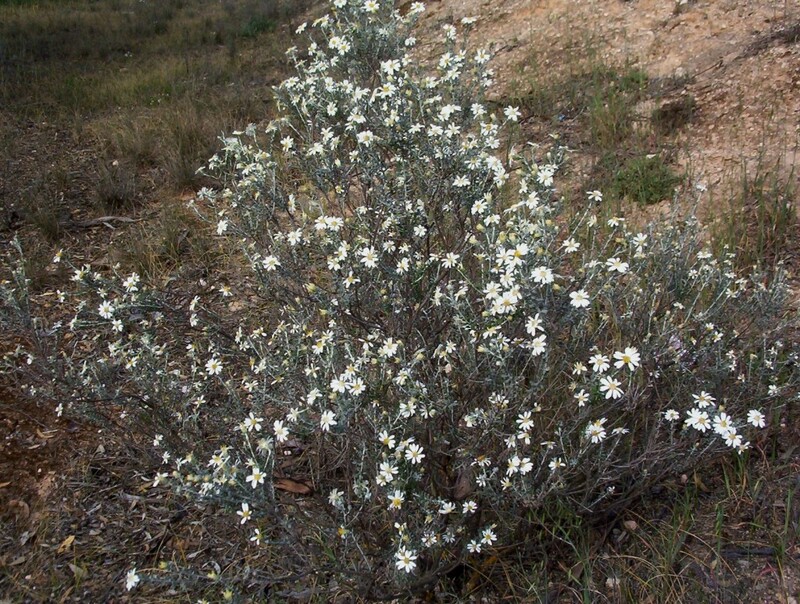 The mallee form is a small clumping plant, with smaller flowers and green leaves. It is a dainty plant compared to the brashness of the others. Olearia passerinoides flowers during the summer here. The white flowers are about the size of a 10 cent coin. Not spectacular but the white flowers on bright green bushes bring a sense of freshness and coolness to the hot summer days. This plant is native to the district and is drought and lime tolerant. 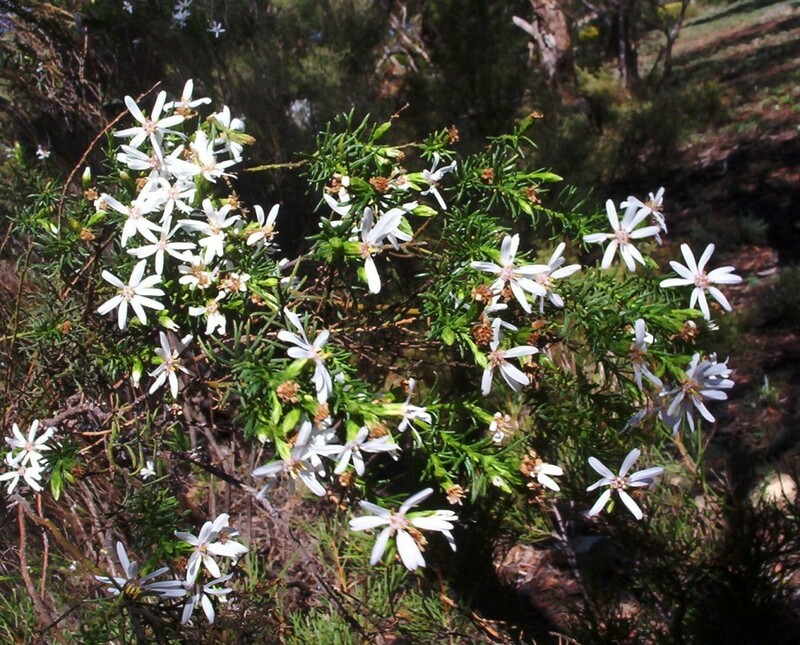 They are shrubs to about 3 metres tall and 2 metres wide. Not much study has been done on Olearias and their cultivation. The dryland plants need to be pruned to prevent the flowers appearing on the whispy ends of foliage. New growth appears low down in the bush and pruning can be done at these points to force out more dense foliage and create a tidier bush. Daisy bushes attract butterflies and the birds that chase them. The birds in our yard use the bushes as staging posts to come down to the bird baths. We spent a couple of hours at Lowan Conservation Park this afternoon. Typical of the mallee in a dry season, everything had finished flowering. However to my delight I found one of my favourite daisies. I wish we had gone there last week as there would have been a hectare of yellow to be seen. This is a perennial plant. I would like to plant a group of them and hope that they self seed around the garden. It would make a great cottage garden plant. I managed to get a couple of good photos of Podolepis rugata (Pleated Podolepis). When flowering finishes, the head becomes a fluffy white ball, which also looks attractive.